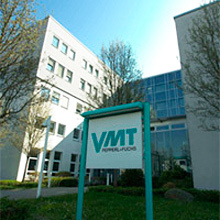 VMT Vision Machine Technic Bildverarbeitungssysteme GmbH as your competent partner. VMT® supplies turnkey image processing, laser sensor systems and customized vision solutions for all industrial sectors. VMT solutions are based on our own self-developed product lines which cover the entire applications spectrum. As the competence center for vision solutions in the Pepperl+Fuchs group, VMT offers absolute high-level technology combined with highest investment security. VMT is a consultant and partner to its customers which provides them with an objective and solid basis for decision-making for their investments. The highly qualified VMT team of engineers has 20 years of experience in industrial image processing. Experienced engineers, technicians and fitters commission your plant and train your employees as well as those of your customers. Customer satisfaction is our highest objective. Through regular customer surveys we strive for a continuous improvement of the quality of our systems, our employees and the co-operation and partnership with our customers. Industrial vision technology provides solutions to add inspection verification into your production operation while speeding up the manufacturing process. Intelligent VMT vision systems are being used in automation, quality assurance, 2D- / 3D position recognition and robot control systems.